In the month of October 2018 Staat van Beleg could list 901 human rights violations (and 162 reports/ analyses). (see our archive) This month we focus on the pledged donor aid during the conference in Cairo for the reconstruction of Gaza, exactly four years ago. Four years have passed since the end of the last military attack on the Gaza Strip. 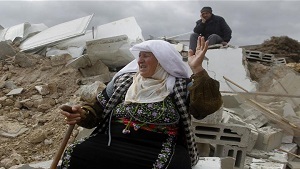 Most of the Palestinian enclave is still in ruins. Many Gazans still do not have a permanent home. They live in shelters and other temporary housing. The absence of basic infrastructure – electricity, clean water, sewage treatment and waste management – has devastated daily life in the Gaza Strip with its 1.9 million inhabitants. While reconstruction continues, 54 percent of the labor force is unemployed, including 70 percent among youth. Gaza can hardly perpetuate the lives of its current residents. With an annual population growth of 2.4 percent, the situation in the Palestinian enclave is becoming increasingly grimmer, while attempts to improve the humanitarian situation and expand reconstruction fail. Meanwhile, the ongoing Israeli siege and shipping blockade of Gaza aggravate these problems and closed off Gaza to the outside world. The conditions in Gaza correspond to those of an open prison; the trapped Palestinians are the victims of collective punishment because they do not meet the demands of the Jewish state. The continued Israeli occupation contributes to the growing despair and frustration of the Gazans. The hopeless and degrading situation emphasizes the need for a political solution to the Israeli occupation. Although a peace agreement between the Israelis and Palestinians seems out of reach, the substandard living conditions in Gaza require the attention of international actors that are engaged to the peace process. If the living conditions in Gaza do not improve in the near future, the region will inevitably experience a new conflict, more violent than the previous one. The Gaza Reconstruction Mechanism (GRM) is a temporary three-party agreement between the Palestinian Authority (PA), the Israeli government and the United Nations, which has been managing the reconstruction of Gaza since the war of 2014. Now that we are four years on, it is clear that the reconstruction of Gaza has not reached the target by far. Instead, the GRM has not only hampered reconstruction, but also institutionalized the Israeli blockade. Several factors explain the slow reconstruction of Gaza. Firstly, limited access to and from the territory has been maintained by both the Israeli and Egyptian authorities. Coordination of governmental activities in the territories (COGAT), a unit of the Israeli Ministry of Defense, must approve all construction and humanitarian convoys that cross Gaza. The two access points are Kerem Shalom in the south for commercial goods and Erez in the north for the manpower. The Egyptian authorities control access via the Rafah border, which opened only 32 days in 2015, 44 days in 2016 and 10 non-consecutive days in 2017 (from May). Due to these constraints, there has been ample support in the Gaza Strip which is essential for an effective reconstruction of the Gaza Strip and its economy. Financing issues have also hampered reconstruction. Despite the great enthusiasm during the Cairo Conference in October 2014, where many commitments were made for the reconstruction of Gaza, many donations have not been fulfilled. The largest commitments came from the Arab block Bahrain, Kuwait, Qatar, Saudi Arabia and the United Arab Emirates. However, this block is also responsible for most of the unpaid payments. From the $5.4 billion pledged at the conference, of which $3,499 billion were meant for projects in Gaza, $1.884 billion (54%) had only been paid by March 1, 2018. Following the conference in Cairo in 2014, the World Bank received a request from the Palestinian authorities and Norway to monitor the payments of donor commitments made during the conference. According to the planned end of the contributions, the last report of the bank was supposed to be released in October 2017. Donor fatigue seems to be another cause for the slow and delayed payout. One of the causes can be explained by the disappearance of previous financing several times, caused by previous wars. The political differences between the Arab countries have also influenced the donations. Qatar and Turkey have made the largest donations for Gaza from all countries in the Middle East ($216 and $139 million). However, these generous deliveries are rare and insufficient for the reconstruction of Gaza. Barring a definitive political solution to the Israeli occupation, donors will reluctantly donate money to Gaza. Above all however, the lack of political will of the Israelis to negotiate with the Palestinians can be seen as the main cause for the failure of the reconstruction of Gaza. The Israeli government has done everything from scratch to sabotage the project. The Gaza Reconstruction Mechanism (GRM) was initiated in September 2014 in an attempt to reconstruct Gaza through a partnership between the Israeli government, the Palestinian Authority and the United Nations. The intention was to transport the building materials to Gaza as quickly and effectively as possible by creating a direct communication line between COGAT and the PA, using a UN employee as intermediary between the two parties. The GRM had to reduce the security problem of Israel and strengthen donor confidence, as was supposed, which would provide the necessary funding for the reconstruction. An extensive system of inspection and monitoring of imports into Gaza was made via the GRM. By meeting Israel’s security concerns, the import of construction materials to the Gaza Strip would accelerate and also facilitate reconstruction and meanwhile job opportunities for young Gazans in the private construction sector would increase. The general purpose of the GRM was to construct and reconstruct Gaza on a large scale. The GRM was a short-term scheme and although no end date for the mechanism was set, the donations should have been transferred within three years, before the end of 2017. (d) address the Israeli security issues. At first glance the GRM seemed to offer a positive outcome for everyone. However, many of the objectives were lost during the implementation. It quickly became evident that the way the GRM was conceived gave Israel’s COGAT the final word over any construction project or construction materials entering Gaza. Thus, Israel’s security concerns were prioritized. Meanwhile, neither the PA nor Hamas were given much say over the rebuilding process and leadership by the “Government of Palestine” was minimized. In fact, the mechanism has failed even to address the third objective. Construction has proceeded at a slow pace and with many delays, which has discouraged donors from increasing the speed at which they disburse aid to Gaza. The purpose of establishing a political tool depends on creating a highly efficient and functioning system to achieve the goal. In theory, that was the primary goal of the GRM. It must provide a clear channel for communication between COGAT, the PA, the UN and the Gazans for reconstruction projects in the Palestinian enclave. However, given the absence of Israel’s political will to make the mechanism work as intended, the GRM became no more than a cumbersome bureaucracy, with the sole consequence of the institutionalization of the Israeli siege of Gaza.